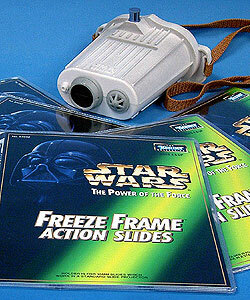 Freeze Frame Slide Display Holder: This was offered on the back of action figures containing the Freeze Frame Slides initially released in January 1998. One holder was available free by sending in one UPC and a receipt, plus $2.00 for postage and handling. Offer expired January 31, 1999. Freeze Frame Slide Viewer: This was fashioned after Luke Skywalker's Macrobinoculars. It includes two Hoth slides, one of Luke and one of Han. The device requires two AA batteries which are not included. While looking into it, you press a slide into the slot and it provides a large image backlit by an internal light. Offered on the back of action figures containing the Freeze Frame Slides initially starting with Chewie as Boushh's Prisoner and Lobot. It was available by sending in one UPC, plus $5.99. Offer expired January 31, 1999. 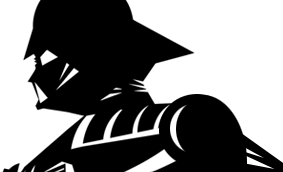 A total of 59 Freeze Frame Action Slides were created. You need five holders to store them all. Ponda Baba is listed on the checklist, and was originally planned to be included in this line. However, he was replaced by Princess Leia in Hoth Gear, although the checklist was never changed. R2-D2's slide originally said "Imperial trash compactor" and was later changed to say "Death Star trash compactor". Luke Skywalker and Han Solo slides were exclusive to the Freeze Frame Slide Viewer.